Without a doubt, one of the most essential rooms in every house is the bathroom. In fact, your day often begins and ends in this part of the home. Therefore, when considering a remodel, don’t discount the bathroom because there are many ways to achieve a stunning personal oasis while also maintaining functionality and efficiency. There are several popular trends to reference when remodeling and plenty of ways to incorporate each in the bathroom of your dreams. For instance, neutral colors such as white combined with gray accents make for an open and airy, timeless feel. On the other hand, dark colors paired with neutral accents are also a popular choice if you prefer a warmer, earthy vibe. 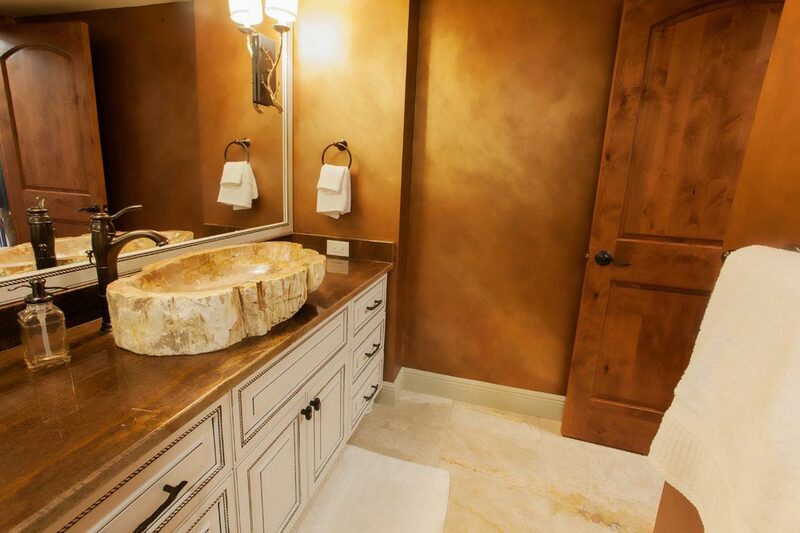 Here are some ways you can integrate your taste and style into your bathroom remodel. A custom vanity can serve as the primary “wow” factor in your bathroom while also being the hub of productivity in the space. For a modern look, consider a raised tempered glass bowl for the wink or even something featuring a bold color that accents your décor. For a more traditional look, a solid surface counter with an undermounted or integrated sink might fit your bathroom best. Consideration should also be given to the vanity cabinetry from wood tones to hardware. We recommend looking at sample door panels with various hardware and a paint swatch from your space to help make the decision easier. Elegant lighting will add a touch of glamorous decor, as well as provide the perfect place to get ready in the morning. Before starting your renovation, consider which type of lighting you’d prefer – recessed, scones, or lights over the mirror or mirrors. Each type serves a different purpose and can really accent your fixtures while providing necessary lighting simultaneously. 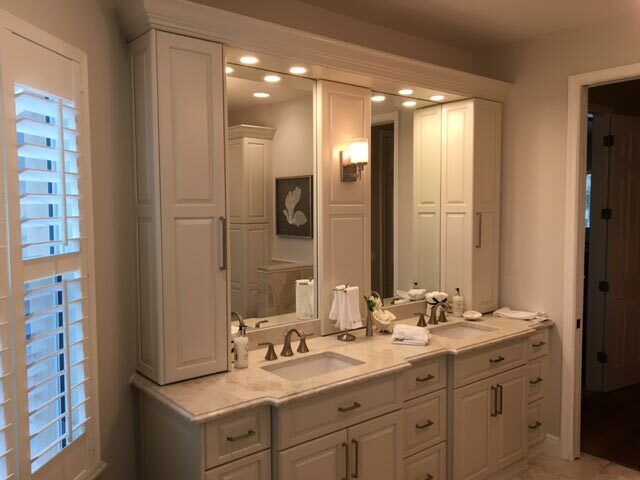 Another thing to consider when remodeling the bathroom is the color and material you want to use for your vanity and sink surfaces. Granite and quartz differ slightly, as granite is a naturally occurring material while quartz is manmade. Some feature movement through the natural patterns within while others are more subdued. When making your selection, consider how the counter will look with the other textures and surfaces in your bathroom including your shower and floor tile. And, of course, the color of your new countertop is another excellent way to tie the entire space together to fit your style preference best. Designing the bathroom of your dreams can be a fun and creative process that should reflect your personal style. If we can help, feel free to stop by one of our showrooms. We can show you built-in examples and discuss your dream bathroom goals.